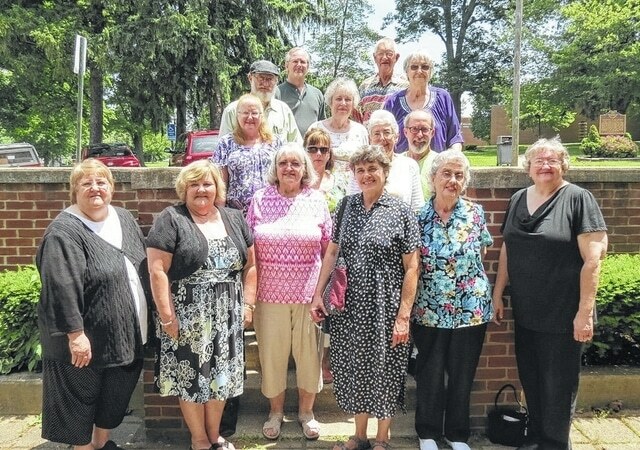 RIO GRANDE — The artwork of local seniors was recently showcased at the Area Agency on Aging District 7’s 33rd annual Senior Citizens Art Show and Essay/Poetry Contest at the Esther Allen Greer Museum, located on the campus of the University of Rio Grande in Rio Grande, Ohio. This year, 193 art pieces were entered in the contest with 48 essays/poems. Special awards were presented: “Victor Potts Best of Show Award” in the Amateur Category went to Alice M. Smith, of Adams County, for her watercolor, “Pink Magnolia”; “Victor Potts Best of Show Award” in the Professional Category went to Pat Thompson, of Adams County, for her pencil, “Conference on the Mound”; the “Mary Peck Friend of Animals Award” went to Rita Haley, of Gallia County, for her acrylic, “Baby Squirrel with His Mother”; People’s Choice Award went to Sharon Brown, of Jackson County, for her acrylic, “Adams County Barn”; Best Overall Essay went to Norma E. Graf, of Scioto County, for “Josie’s Rose”; and Best Overall Poem went to Jeri Ingles, of Gallia County, for “Your Life is a Book”. To learn more about next year’s art show, which is typically in May or June of each year, call 1-800-582-7277.